Goodyear, Akron's last remaining rubber baron, decides that it won't uproot its 3,500-employee Ohio headquarters, relocating instead at a new local site. But that short move will spark two million sq. ft. (180,000 sq. m.) of additional Akron development and perhaps as many as 8,500 more jobs. kron, the hometown of basketball star LeBron James, threw down its own economic slam dunk as the 2007 game clock ticked down to an end: The northeast Ohio city rang up a multifaceted US$900-million venture that could involve as many as 12,000 jobs over a seven-year span. The big three in making the Akron project happen: (left to right) Akron Mayor Don Plusquellic, IRG President and Senior Managing Partner Stuart Lichter, and Goodyear Executive Vice President and Chief Technical Officer Joe Gingo. 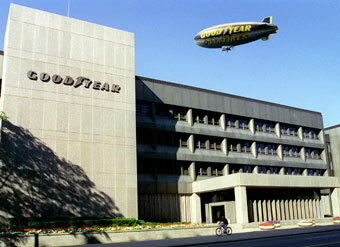 Goodyear's home for its entire 108-year existence. "There was a day when our community took for granted companies large and small," Akron Mayor Don Plusquellic said at the Dec. 5th announcement of Goodyear's plans. "You know, they're here, they're always going to be here. But the world has changed. So when a Fortune 500 company that can operate literally anywhere in the world with technology makes an announcement that they're recommitting to their community, it is a great day in Akron." But Goodyear's new 450,000-sq.-ft. (40,500-sq.-m.) world headquarters, built by California developer Industrial Realty Group (IRG), is only the half of it. Much less than half, really, in terms of overall jobs, investment and space in Akron. Goodyear's relocation next year to the new headquarters will tip over a whole stack of related development dominoes: IRG will build and redevelop an additional two million sq. ft. (180,000 sq. m.) that could trigger as many as 9,500 more corporate, retail and service-sector jobs. "This project has been called the most ambitious development effort in the history of the city of Akron," Goodyear Executive Vice President and Chief Technical Officer Joe Gingo noted at ceremonies at the company's World Technical Center, located adjacent to the new south Akron headquarters site. "This announcement represents a tremendous and truly historic success," continued Gingo, Goodyear's point man in negotiating the deal that will keep the company rooted in Akron. "I cannot say enough about the positive spirit of cooperation between all the groups who helped make this vision a reality." That vision couldn't have reached fruition without a very large dose of teamwork, urgently marshaled up to meet Goodyear's challenging deadline. "The degree of public-private partnership in making this project happen was pretty extraordinary," Akron Deputy Mayor for Economic Development Robert Bowman tells the SiteNet Dispatch. "At times, we had 40 people meeting together in one room." That single room contained a small squadron of project players. Goodyear was there, of course, as was developer IRG, plus numerous representatives from myriad arms of city, county and state governments. The ambitious venture that galvanized that group started to take shape in late 2006. Goodyear's top officials had known for years that the existing seven-story headquarters and an adjacent six-story facility sorely needed an upgrade. Parts of the north Akron complex were almost 100 years old, and the space was so segmented that it stifled employee collaboration. 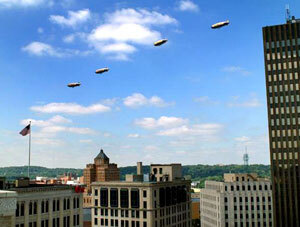 In 2006, Goodyear started getting very serious about finding new corporate digs – soon. Chairman and CEO Bob Keegan initiated extensive internal discussions about dramatically improving the headquarters situation. Somehow – no one is quite sure how – word of Goodyear's discussions leaked out. Downey, Calif.-based IRG was among the first to get wind of the action, and it sprang into action immediately. IRG President and Senior Managing Partner Stuart Lichter quickly contacted Goodyear, outlining an idea like the developer's 2005 deal with Lockheed Martin for 2.1 million sq. ft. (189,000 sq. m.) at Akron Fulton International Airport. "Stu Lichter is one of those gentlemen who is an opportunist," explains Bowman, who's frequently worked with IRG on local-area projects. "When he sees opportunities, he moves on them. So IRG approached Goodyear with the idea that they could do something similar to what they did with Lockheed. IRG purchased Lockheed's airport buildings, redeveloped them and then leased Lockheed's space (which housed 500 employees) back to the company. 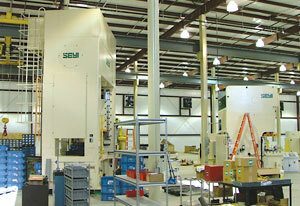 The rest of the space IRG is filling with manufacturing operations." The developer's Akron track record also includes Canal Place, the downtown redevelopment of the former B.F. Goodrich headquarters complex that now houses more than 2,000 workers. "IRG has done a lot of good for the Akron area," says Bowman. "They know how to develop these older buildings, and they've been very successful at it." Goodyear was already familiar with IRG. The developer several years earlier successfully redeveloped a closed company plant in Huntsville, Ala. Lichter's ideas for an Akron headquarters piqued Goodyear's interest. By early December of 2007, discussions broadened to include first the city and then the state. That team began to flesh out details. Then in April of last year, the closed-door discussions became very public. 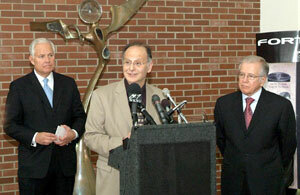 Goodyear announced that it would stay in Akron – if the city presented an acceptable offer by the end of 2007. "Our outdated facilities are not conducive to effective and efficient business in today's environment," Goodyear's Gingo said in an April release. "Working with Stu's team, we have initiated a comprehensive study to review the economics, viability and benefits." 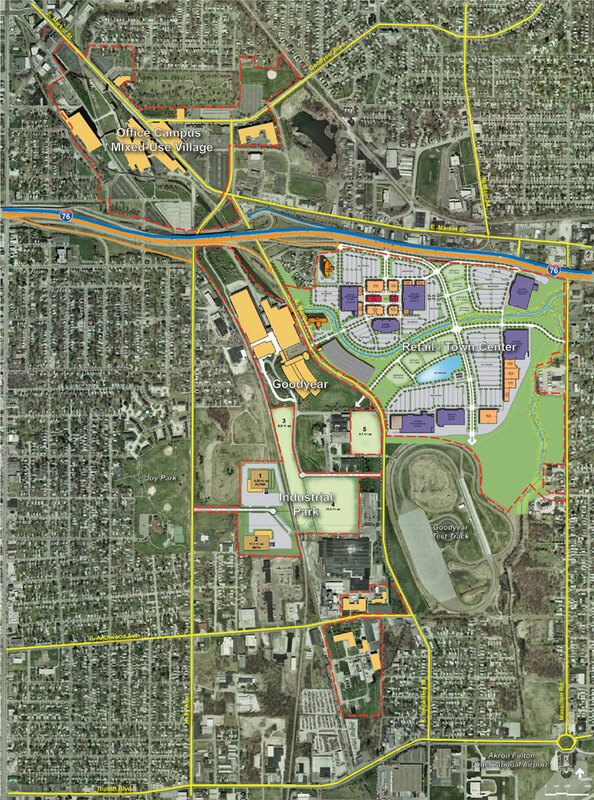 This plan depicts the entire Akron development. The "Office Campus Mixed-Use Village" at the top represents the redevelopment of Goodyear's old campus. South of that lies the company's new headquarters ("Goodyear"), plus the nearby "Industrial Park" and "Office Campus Mixed-Use Village." Click the reduced image above to view the plan. leasing the headquarters back to the company. IRG would also renovate the company's World Technical Center. In addition, the developer would convert Goodyear's four-floor data center into a 1,600-space parking deck for the new headquarters, building a new 1,500-space deck as well. The two decks, which will cost $44 million to construct, will be owned and operated by the Summit County Port Authority. But that was just the tip of the project's outsized iceberg. IRG also plans to develop 1.2 million sq. ft. (108,000 sq. m.) of space around Goodyear's new south-side headquarters, including an industrial park and retail and residential space. That square footage will clearly house a lot of jobs, though officials haven't provided specific projections. In addition, IRG would follow that project by redeveloping Goodyear's current north Akron headquarters into another 800,000 sq. ft. (72,000 sq. 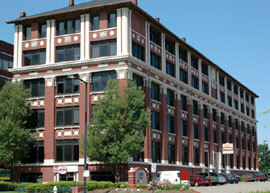 m.) of office, retail and apartment space, creating an estimated 2,000 jobs. That was certainly complicated enough. But the financing for all those multiple parts had to be firmly put in place. IRG has pledged $700 million for the entire project. If the deal was actually going to fly, though, local, county and state governments had to deliver an additional $200 million. The pending project soon got an extra jolt of urgency. Once news of Goodyear's plans went public, other states came calling to bid for the headquarters, including Arizona, North Carolina, South Carolina and Virginia. The stage seemed set for an all-out recruiting battle, with dueling subsidies a virtual certainty. But that smoldering war between the states never really got a chance to fully ignite. It couldn't, since Goodyear had resolved to give its long-time hometown a full-scale shot at the project. "Goodyear was pretty straight up with us," Bowman notes from his Akron office. "They told us that they were not going to enter discussions on their headquarters with anyone else until we went through this process. If we couldn't meet their needs, then they would open the project up." "Goodyear is an excellent corporate citizen," he continues. "Normally, we don't get those kind of chances." Capitalizing on that chance, though, was going to require intensive coordination between a host of public and private groups, working under do-or-die pressures. "Yes, it was a very demanding time frame that Goodyear gave us," says Bowman. "When you have so many parties representing so many entities, that in itself could break down the process." Leaders in the many organizations involved in the project gave their troops firm marching orders: Pull hard, and pull together. That effort got an added boost from Akron's past. "We have a history in this community of the public and private sectors working together," Bowman explains. "That's half of the necessary elements. Those two sectors can't be in combative positions. This kind of project wouldn't work in that case." Jane Campbell, managing director of Colliers International's Public-Sector Solutions division, also played a key role in the venture's intricate coordination. Campbell was very familiar with the thinking of Goodyear's top brass, since Colliers handles much of the company's real estate work. In addition, she knew a lot about Ohio and Akron. Campbell was mayor of nearby Cleveland from 2002 to 2006, working closely on projects with Akron Mayor Plusquellic, who's been in office for 21 years. "It helped the Goodyear project work a lot to have the same coordinator working for everyone that was involved," says Bowman. "Jane Campbell understood the process that was going on, and she kept the agenda going." In early December the final pieces of the agenda for Akron's bid clicked into place. The Ohio Tax Credit Authority on Dec. 3rd offered Goodyear a 27-percent, 15-year tax credit if the company kept 2,900 jobs at its headquarters for the 15 years. (Goodyear at its headquarters currently has 3,000 staffers and 500 contract workers, and it may relocate some other local employees to the new site.) Also on Dec. 3rd, the Ohio Development Financing Advisory Council separately approved a $20-million low-interest loan to help finance the new headquarters' parking decks. Akron then gave Goodyear its offer. The company examined the bid, and then scheduled a press conference. "This is a major milestone for the future of Goodyear and the Akron community," CEO Robert Keegan said Dec. 5th. "This . . . will keep Goodyear's worldwide headquarters in Akron for decades to come. "We didn't do a lot of benchmarking on this," Keegan explained. "But I would say [that] what you'll find over time is that this kind of arrangement will be more and more the norm. We're very choice-ful allocators of capital. So our thinking is, 'Why invest capital in a headquarters building as long as I've got a long-term lease for it?' 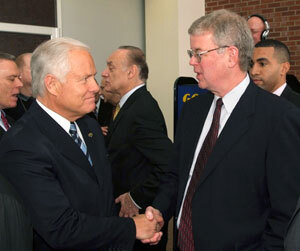 "
Goodyear Chairman and CEO Robert Keegan (right) shakes hands with Akron Mayor Don Plusquellic after the company announced its plans to stay in the Ohio city. The new headquarters space will emphasize corporate integration and teamwork, he added. Technically, the whole deal is still tentative. It won't be official until all project financing is formalized, which will happen within 60 days of the project's announcement, officials projected. 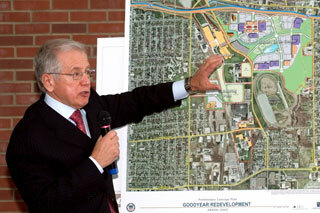 Construction on Goodyear's new headquarters will be completed in 2010, IRG officials estimated. The developer, which has already hired Cincinnati-based Bear Creek to recruit its retail tenants, won't complete all of its construction until 2014. Goodyear seems set to stay in Akron for decades. The company will sign a 20-year lease with IRG on its new headquarters, followed by 11 five-year renewal options. (The financial terms of the lease haven't been made public.) In addition, the assistance that the Ohio Tax Credit Authority approved, which is valued at about $30 million, includes a clawback provision that Goodyear must stay at the new location for 30 years. Goodyear Executive Vice President and Chief Technical Officer Joe Gingo describes the company's headquarters plans at the project announcement. including Goodyear's 3,500 retained positions. The 12,000-job estimate also includes the projected spin-off development in a large area surrounding IRG's redevelopment of the company's old headquarters. However you tally the numbers, though, Akron has a dizzy amount of development on tap. And some similar expansions may be sitting out on the near-term horizon, local officials think. "There may be a couple of more projects like this one out there," says Bowman. Partnerships like the Goodyear deal, he adds, may also become more of a fixture in business expansion. "In the future for economic development," Bowman says, "with scarce resources, a lot of governments now are getting to a point where they get tapped out by all of the requests made in the competition for private development. "I think that the private development community is beginning to see that," he continues, "that there's a need for greater participation and a need to be straight up with one another – that I can do this, if you can do that. Rather than just a one-way street of: What are you going to give me?" Clearly, there's a lot of giving in the Akron project, but it's on a street that doesn't go one way, but many. "This project," Bowman concludes, "made sense for everybody." An artist's rendering of the FutureGen plant, which will produce 275 megawatts, enough to power about 150,000 single-family homes. utureGen, the U.S. Department of Energy's (DOE) landmark showcase for clean-coal technology, at last has a clear-cut home address – Mattoon, Ill. At the same time, though, several major details in the US$1.75-billion project have gotten cloudy. The selection of Mattoon, a city of some 18,000 residents in coal-rich east-central Illinois, was announced on Dec. 18th by the FutureGen Industrial Alliance, a consortium of private-sector energy concerns partnering with the DOE. The nonprofit global alliance picked a 444-acre (178-hectare) site a mile northwest of Mattoon. 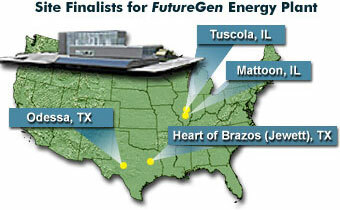 four FutureGen finalists selected in the summer of 2006. Mattoon beat out two short-listed Texas sites in Jewett and Odessa, plus another Illinois finalist in Tuscola. 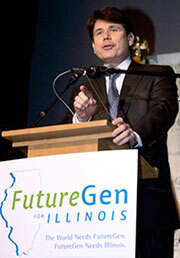 "We are thrilled that Illinois will be home to FutureGen," Illinois Gov. Rod Blagojevich said at the announcement at the National Press Club in Washington, D.C. "FutureGen's near-zero-emission coal-gasification technology holds great promise to revolutionize our nation's coal industry … while reducing the greenhouse gases that cause climate change. As the entire world watches, Illinois is ready to get to work to ensure that FutureGen is a success." But significant uncertainties shadow FutureGen's timetable, as well as its financing and design, as the DOE underscored in a statement issued a few hours after the site announcement. "Clean coal technology is a vital component of the Bush administration's vision for a cleaner, more secure energy future," DOE Principal Deputy for Fossil Energy James Slutz allowed. But, he added, "Projected cost overruns require a reassessment of FutureGen's design … FutureGen [must] deliver the greatest possible technological benefits in the most cost-efficient manner. This will require restructuring FutureGen to maximize the role of private-sector innovation, facilitate the most productive public-private partnership, and prevent further cost escalation." The DOE, which was conspicuously absent at the site announcement, has clashed of late with its private-sector partners over project financing. The agency unsuccessfully tried to persuade the alliance to delay the site announcement, urging it to first commit more funding. FutureGen's price tag has doubled from the initial $850-million estimate. The FutureGen Alliance has a 10-year $400-million commitment. 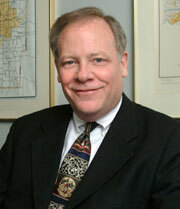 Project costs will increase by $10 million every month, said FutureGen Alliance Mike Mudd CEO (pictured). 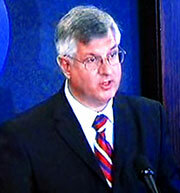 "Projected cost overruns … will require restructuring FutureGen," said the Department of Energy's James Slutz (pictured). but site work can't begin until the agency issues a formal Record of Decision. The project is already facing a funding shortfall. The U.S. Congress approved $75 million for FutureGen spending for this fiscal year, $33 million less than what project supporters had requested. FutureGen Alliance CEO Mike Mudd addressed that financial gap at the Dec. 18th Mattoon site announcement. While he empathized with the need to pare back the budget, Mudd noted, "Our hope is that this year's shortfall will be made up" in later federal appropriations. But delaying the project will further increase costs, he emphasized. "It is important to maintain the schedule to control the costs," said Mudd. "The FutureGen costs will continue to be what they are. They will increase consistent with the rate of inflation of any coal plant, ethanol plant, chemical plant, or anything that uses metal. That's just the harsh reality of inflation. "We are working hard to control costs," he continued. "But on a project like this, costs increase by $10 million every month." The FutureGen Alliance, Mudd added, is receptive to further discussions with the DOE about project costs. "It may be possible to reach some agreement" with the agency, he said. On the federal side of the equation, Slutz said, "DOE looks forward to continued work with the private sector and its international partners to ensure the success of FutureGen." 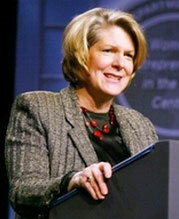 The DOE has said that it will release the details of its proposed restructuring later this month. In the meantime, the project's potentially far-reaching benefits wait in abeyance. FutureGen would be the first commercial-scale coal-fired power plant to ever produce electricity and hydrogen while dramatically reducing harmful pollution. The FutureGen facility won't burn coal, but will pressurize it using integrated gasification combined-cycle (IGCC) technology. That process will produce a gas from which pollutants can be separated. The enriched hydrogen gas that remains will then power a turbine functioning much like a jet engine. Significantly, most of the CO2 emissions produced in FutureGen's pressurization won't be released into the air. They'll be captured inside the plant and then sequestered, injected thousands of feet below the ground's surface for storage. FutureGen's initial goal is to capture at least 90 percent of the plant's CO2 emissions. Some environmental groups have opposed the FutureGen project, calling the idea of clean coal an oxymoron. But other significant figures support the project. "There should be a moratorium" on construction of new U.S. coal-fueled power plants, James Hansen, the director of NASA's Goddard Institute for Space Studies who's considered the dean of American climate researchers, said in a speech last year. "Until we have that clean-coal power plant, we should not be building them," Hansen asserted. Similarly, Sierra Club National Coal Campaign Director Bruce Nilles has also called for a moratorium. 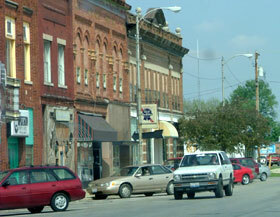 The city of Mattoon (pictured) in east-central Illinois has about 18,000 residents. The Mattoon site sits atop the highly porous Mount Simon Sandstone formation. 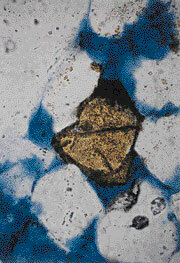 The Mount Simon cross-section pictured above has been injected with blue epoxy, making its empty pore spaces readily apparent. For Illinois, the stakes riding on the project's reaching fruition are considerable. The plant's estimated 150 direct jobs are comparatively modest for such a big-ticket venture. But a far larger economic impact would come from the cluster of innovative power-industry operations that many analysts see FutureGen attracting. That belief is given added weight by the large number of major power-sector players that are already FutureGen Alliance members. That group, which began partnering with the DOE in 2005, includes American Electric Power Service; Anglo American Services (UK); BHP Billiton Energy Coal; China Huaneng Group; CONSOL Energy; E.ON U.S.; Foundation Coal; Luminant; PPL Energy Services Group; Peabody Energy; Rio Tinto Energy America Services; Southern Company Services; and Xstrata Coal. In addition, the Illinois coal industry could experience a major economic upsurge if the FutureGen plant is successful. The state has enough coal to supply all U.S. power demands for almost 100 years, according to the Illinois Coal Association. But Illinois coal has fared poorly since 1970's passage of the U.S. Clean Air Act. Because of its high sulfur content, the state's coal burns "dirty." Consequently, power producers for almost the last four decades have largely opted instead for low-sulfur coal mined in the U.S. West. If FutureGen demonstrates IGCC's feasibility, market demand for Illinois coal would be reignited. "The final site was selected based on science," Mudd explained, "a balance between the risks and the benefits, and an analysis of the cost on economic impact of each site's bid. It was not based on politics." The FutureGen Alliance site selection team used over 120 different factors in analyzing the contending sites, which initially totaled 12 locations in seven states. "Mattoon was selected because it provides many clear advantages," said Mudd. "A clear legal title of the power plant site, a very good water pool and very good geologic conditions for permanent carbon sequestration" were among the Illinois location's pluses, he explained. The Mattoon site is located atop the Mount Simon Sandstone, a rock formation well-suited to CO2 storage. Mount Simon consists of 2,000 feet (607 meters) of highly porous sandstone that sits more than a mile below the ground. a $981-million bid from Texas. Illinois' subsidies were far smaller, totaling $80 million in grants, low-interest loans and tax breaks. Both Illinois and Texas offered to indemnify the project. Each state said that it would assume the title to the plant's CO2, which would relieve FutureGen from any financial and legal liabilities that might arise from greenhouse gas storage. The project's site selection comes as the utility industry is facing something of a crossroads. Many utilities are scaling back their plans for constructing coal-powered plants. Their reluctance to build is largely based in rising construction costs, combined with uncertainties over future U.S. guidelines for carbon regulation and taxation. That reserve could fade, though, if FutureGen's IGCC technology proves suitable for widespread commercial adoption. But just when such firm evidence might surface remains uncertain. The FutureGen Alliance schedule targets July 2009 for construction startup, with the plant going online in 2012. That timetable could change, though, with the DOE's restructuring of the project. "I wish we could move faster," said Mudd. "But it takes time." FutureGen's projected timetable (pictured) could be in jeopardy. Cars – and their multiple suppliers – are falling, fast, on Alabama. And that surge reflects the supplier sector's rise to ranking as "the core of U.S. manufacturing." Netherlands-based Cylpro found that Auburn and its home territory had a lot in common. simple drive along a short stretch of communities between Montgomery and Atlanta last spring revealed all one needs to know about Alabama's continuing growth curve in the automotive industry: Sure, OEMs abound, such as the Mercedes-Benz complex in Tuscaloosa that just made its 1 millionth vehicle in late 2007 and the Kia plant gradually taking shape just across the Georgia state line in West Point. But as in the rest of the U.S., suppliers rule when it comes to steady projects and job creation. 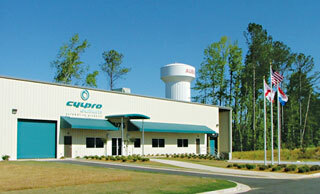 In Auburn, family-owned tier-3 supplier Cylpro, a maker of cylinders for hydraulic pumps, launched pilot production in a new building in early 2007, just around the corner from some of Auburn University's large land holdings. Plant manager Tory Foster, formerly an operations manager for Rexnord Industries' Falk division just down the street, started his time with Cylpro Auburn Inc. by going to the company's home base in Hengelo, Netherlands, for two weeks of training, the cost of which was reimbursed by the city of Auburn's Industrial Development Board (IDB). That level of commitment was evident in the speech made by Arndt Siepmann, director of industrial recruitment with the city of Auburn, who used "we" in talking about the company's aspirations. He said the firm had looked for years for a joint venture, before finding the right opportunity in Auburn, where it took advantage of a program from the Auburn IDB that assists companies with design-build construction and leases the facility to the company. The program is financed through a pool of five local banks and supported by a state grant for site development work performed by public entities. "For smaller and mid-size companies, while they have to invest in machinery and work force without revenues, we can at least take the building off of their investment list," Siepmann said in an interview. "It's a great benefit, especially for foreign companies that cannot borrow here." The company, which has only 70 employees in total, will employ up to 15 operators and machinists at the operation as it ramps up to full production. Kuka machines purchased in Germany will help Cylpro churn out the hydraulic systems that go to suppliers such as Chicago-based Powerpacker and Hoerbiger Automotive Comfort Systems, before eventually landing in convertibles from the likes of Mercedes-Benz, BMW and Karmann. Siepmann pointed out that Auburn has purposely targeted these small suppliers, sometimes driving away business because some companies' requirements are on too large a scale. 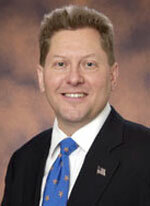 Foster said Cylpro looked hard at Chicago, because Powerpacker was headquartered in nearby Glendale, Ill. But Auburn and the automotive momentum in Alabama and the south were a better fit. Foster said cultural differences between Alabama and Holland are not as great as one might think, especially when working for a family-owned firm: "The similarities surprised me," he says, "in work customs like hours, overtime and holidays. The benefits are different, but [that's because] it's a different social system." Other parallels pertain: Cylpro already had a connection to the University of Delft in the Netherlands, which coincidentally has a partnership with Auburn University. Foster said company leaders also see the Auburn area's transition from farming and textiles to advanced manufacturing as a re-enactment of what happened in their part of the Netherlands 25 years ago. 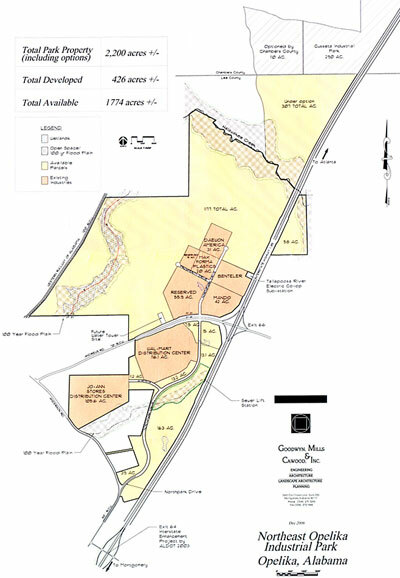 This map of Northeast Opelika Industrial Park, accurate through spring 2007, shows both its existing acreage and its proximity to the neighboring Cusseta Industrial Park. Foster was visited in turn by a colleague at German firm Aluminum Technology Schmid North America Inc., currently residing in a city-owned incubator, but planning on moving into a new building next year. Cylpro was borrowing a machine from Schmidt, one of six German companies in the direct area. Siepmann said there around 30 German-speaking families in the growing town. Contacted again in the fall, Siepmann said the grand opening for Cylpro in October included 40 guests from Holland and a representative from the Dutch consulate in Miami. He also mentioned a new $2.8-million, 10-job project from design-build tooling firm toolCare U.S. International, and the arrival of a new Korean project from CNJ Tech, Inc., a 25-job, $15.6-million investment at Auburn's Industrial Park. The CNJ project is part of what he called a growing cluster of Korean operations in the area, as CNJ, the U.S. subsidiary of Korean-based Yangjung Industry Co., makes its first U.S. investment for the manufacture of brake discs and knuckles. "The excellent quality of life and the education system of the city of Auburn made our decision easy," said Gyu Yong Chung, president and CEO of CNJ Tech. "Its strategic location halfway between the Hyundai plant in Montgomery and the future Kia plant in West Point makes it the perfect fit for us. We are a rather small company in Korea, and this is our first investment abroad. We could not have done it without the help of the city of Auburn." Last spring, a short hop up the Interstate the same afternoon as the Auburn visit led the curious driver to neighboring Opelika, part of a metro area that has been among the national leaders in corporate project attraction for cities its size, and which has its own share of Korean business. 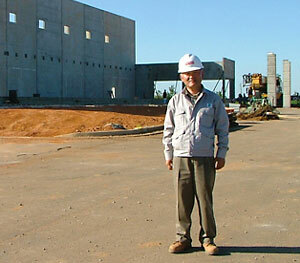 Paul Jouh, president of Daewon America, pictured at the company's plant site in Opelika in May 2007.
there were four people on his project's site selection team, and that this was the first time the company had pursued a greenfield project, having always gone into an existing building previously. The Opelika plant joins a global portfolio that now includes plants in South Korea, China, India, Poland and Russia, all following OEM plant development from Hyundai. Lori Huguley, project manager for Opelika Economic Development, says the city first heard from Daewon in August 2006, and the announcement was made three months later, after Opelika bested competitor locations in Georgia and elsewhere in Alabama. Jouh described a rapid timeline on the project both before and after breaking ground, that would draw to a close as some 150 shipping containers full of the plant's equipment made their way from Seoul and Incheon to the Port of Long Beach and then over by rail to Fairburn, Ala.
Crucial to the attraction was the fact that in-situ utility infrastructure meant the company could meet its schedule. "Money flees uncertainty," said Al Cook, director of Opelika Economic Development, who confirmed at year's end that test manufacturing already had begun at the Daewon plant. Earlier in the spring, Opelika and Lee County partnered with neighboring Chambers County and the city of Cusseta to add more certainty by adding more acreage to the industrial park, which now encompasses 2,200 total acres (880 hectares), with 86 percent of that footprint left to be developed. Cook said the labor pool within 30 miles (48 kilometers) is substantial and skilled, drawing in part on the region's textile heritage. The area is also only 35 miles (56 kilometers) from the booming town of Columbus, Ga., which is seeing a double shot of growth due to both corporate and military expansion. By locating far from the entrance of the Cusseta Industrial Park, Great Lakes Metal Stamping has helped further completion of the park's infrastructure. and the first to locate in the new 430-acre (174-hectare) park. It helped that park's development by selecting a site at the very back (closest to Opelika's park and, therefore, its sewer network), which sparked immediate roadwork to extend to the site from the park's entrance. That work was funded by federal and state grants, including $900,000 from a state of Alabama Industrial Access Road Grant. Carrie Yeats, assistant director of the Industrial Development Authority of Chambers County, said the park first came into being in 2001, with 300 acres (121 hectares) purchased through a $1.73-million bond issue. In 2007, she said, "an additional 130 acres (52.6 hectares) was purchased with a federal appropriation from SBA and HUD through the work of US Congressman Mike Rogers and U.S. Senators Richard Shelby and Jeff Sessions." Yeats also said talks are ongoing about a possible road connecting the neighboring industrial parks. That would really accrue to the benefit of both: Among other industries it serves, Tier-2 supplier Great Lakes will supply stamped and welded brackets to Benteler Automotive ... currently next door in that Opelika park. Great Lakes, which employs just over 100 in its 12th year of business, says employment in Cusseta alone could reach that same level in the next several years. Alabama Industrial Development Training will assist with recruitment, screening and pre-employment training. "We have reviewed 16 communities in multiple states over the past year and have chosen Chambers County to be the home of our second facility," said Great Lakes owners Keith and Betty Hettig. "The camaraderie of the community leaders and residents played a significant role in our decision … GLMS is a people-oriented company and we are looking forward to being part of the growth and excitement that is about to take place in this area." Alabama's auto-supplier surge is anything but unusual. In fact, U.S. motor vehicle parts suppliers comprise the nation's leading manufacturing sector, according to findings of a 2007 study of the industry by the Center for Automotive Research (CAR) for the Motor & Equipment Manufacturers Association (MEMA). The supplier sector is contributing to 4.5 million jobs nationwide, the report found. "This is the first study ever undertaken that shows the true economic impact of the motor vehicle parts supplier industry," said CAR Chairman Dr. Dave Cole. "While the industry is always changing, the study clearly establishes auto suppliers as the core of U.S. manufacturing." According to the study, motor vehicle parts suppliers directly employ 783,100 U.S. workers, and every supplier job creates another 4.7 jobs in the economy. Those "other" positions that have been created, said the report, include an additional 1.97 million jobs in industries ranging from steel to plastics that support the supplier industry, plus another 1.7 million jobs supported by the spending of suppliers' direct and indirect employees. Motor vehicle parts suppliers are the top employers in seven states – Indiana, Kentucky, Michigan, Missouri, Ohio, South Carolina and Tennessee. In addition, a number of other states now have supplier employment in excess of 15,000 jobs, including Alabama, California, Georgia, Illinois, New York, North Carolina, Pennsylvania, Texas and Wisconsin. Just a few years ago, vehicle manufacturers were more highly integrated, producing many of the parts in-house for the vehicles they sold, MEMA President and CEO Bob McKenna explained in the study's release last January. By the start of the 21st century, however, most part-making operations had been moved out of the assembly companies into independent, stand-alone operations selling components to multiple customers – reflecting exactly what's happening in Alabama. Today, fully two-thirds of the value of the average car or light truck is provided by suppliers, said McKenna. And the jobs that auto suppliers are creating are well-paying positions, the study showed. Supplier jobs on average provide more than $45,000 in annual compensation per worker, said the CAR-MEMA report. Enjoy this original content? Bookmark it to share with your friends! CONTINUE TO THE LATEST EDITION OF "SNAPSHOT FROM THE FIELD"
�2008 Conway Data, Inc. All rights reserved. Data is from many sources and is not warranted to be accurate or current.